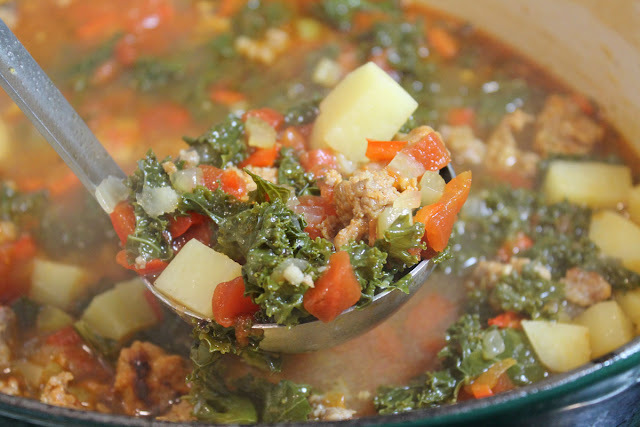 Through the fall and winter months, I like to make a big pot of soup at least once a week. We'll have it for dinner and then for lunches until it is gone. Most of the time, I'll make a loaf of bread to go along with it because we love to dip our crusty bread into the soup. 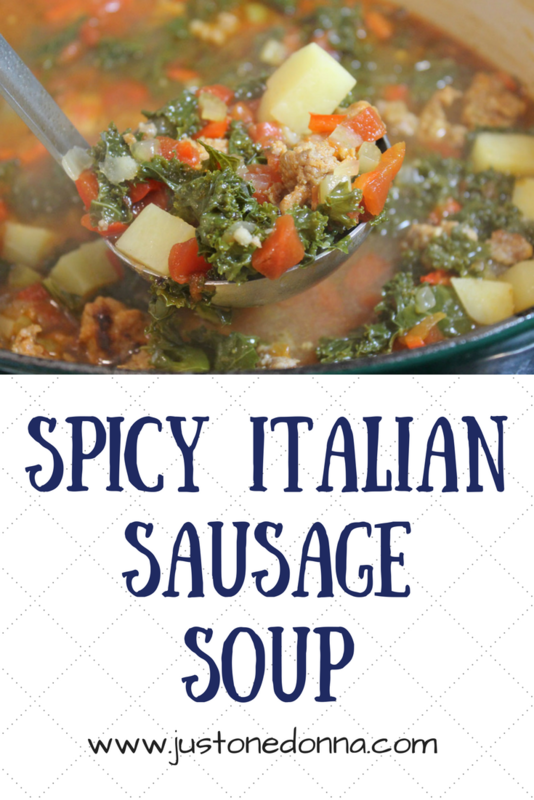 Today's recipe for Spicy Italian Sausage Soup is one of those soups that will be perfect with a crusty bread for dipping. This post contains affiliate links for your shopping convenience. I receive a small compensation when you shop through these links to help support publishing this blog. Spicy Italian Sausage Soup is made quickly on the stovetop. You can control the spiciness by adjusting the ratio of sweet Italian sausage to hot Italian sausage. 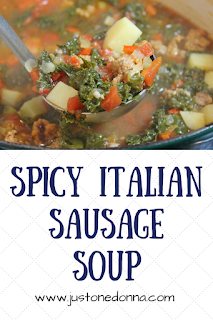 I use half hot Italian sausage and half sweet Italian sausage and the soup has just the right amount of spice for me. Potatoes are yummy in this recipe. Sometimes I'll substitute pasta for the potatoes. Any pasta you are in the mood for will work, even gnocchi or cheese tortellini. That means you can change this recipe each time you make it and it will seem like a different soup. This soup will freeze well. I like to use quart deli containers that I buy online for soup. They are a perfect size. Soup in the freezer is a good thing. Heat the olive oil in a large dutch oven over medium heat. If using sausage links, split the casings and remove the sausage. Break the sausage into pieces and place them into the pot. Throw out the sausage casings. Cook the sausage until browned. Remove from the pan and set aside. Remove excess oil from the pan. You want about one tablespoon in the pot to cook the vegetables. Add the red pepper, celery, and onion to the pot and cook until soft, about five minutes. Grate the garlic into the pot and cook for one minute. Return the sausage to the pot. Add the tomatoes and chicken stock to the pot. Bring to a boil. Reduce to simmer and cook for ten minutes. 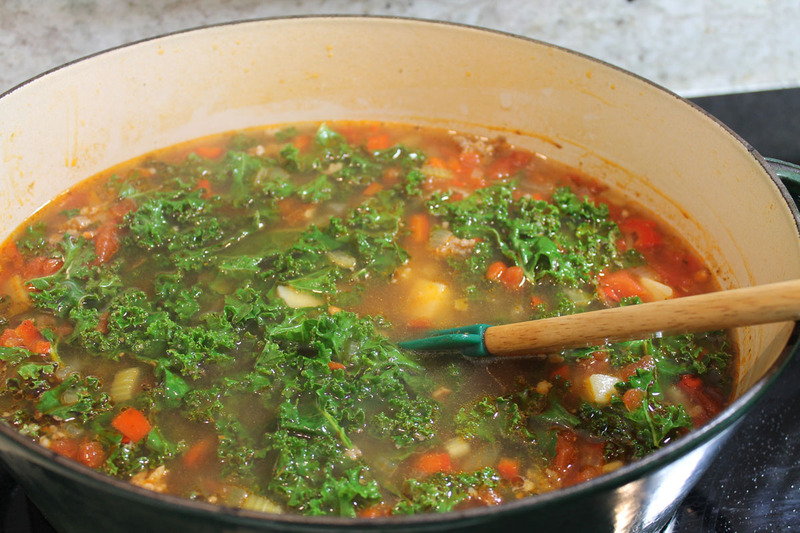 Add the potatoes and kale to the pot. Bring to a boil, Reduce to simmer and cook for ten more minutes, or until the potatoes are soft and the kale is tender. Taste for seasoning and add salt and pepper as needed. Serve hot. I love serving soup in single serving soup bowls like these crocks. These colorful single serving bowls would also be fun for soup night. 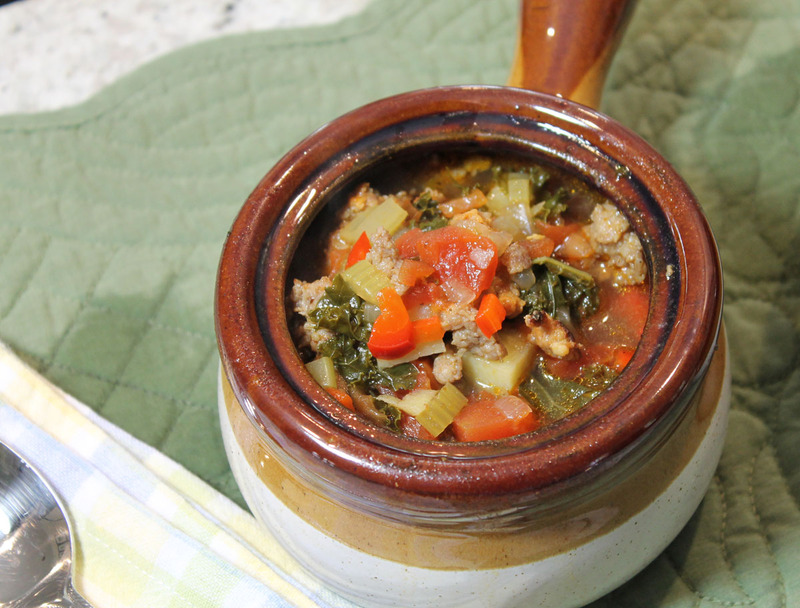 Check out more than two hundred soup recipes on my Soups Pinterest Board.